Immigration, Citizenship, green card and temporary visa application help lawyer. If you are looking to work or live in the United States there are a number of options available to you. The first step in helping decide which option works best for you is to get a better understanding of U.S. immigration law. The two primary categories of U.S. immigration law are temporary residence visas and permanent residence visas. Green cards and immigrant visas are the better known names for permanent residence visas and temporary residence visas are also known as non-immigrant visas. The majority of people looking to work or live in the United States are looking for permanent residence visas. This is simply because a green card allows for permanent residence in the U.S. with little or no restrictions. With a green card a person can work for anyone or live pretty much anywhere in the U.S. The one issue is that getting a green card can be more difficult than getting a temporary visa. If you are looking for permanent residency there are four primary ways to get a green card. EB-1: This is for aliens with extraordinary ability such as researchers, outstanding professors or multinational business executives or managers. EB-2: This is for aliens with advanced degrees who have an employer or sponsor or aliens with exceptional ability. EB-3: This option is for unskilled workers with an employer or sponsor, skilled workers and professional workers with a university degree. EB-5: This is an option for aliens who are able to invest $1,000,000 and create at least ten new full time jobs. It is also possible in certain limited situations that an investment of $500,000, if it creates at least five new jobs, may be acceptable. In order to qualify for a family sponsored green card, you need to have a close relative in the United States that is either a permanent resident who holds a green card or is a U.S. citizen. It is possible to qualify relatively quickly for a green card if you are a close family member of a U.S. citizen. Priority is given to husbands, wives, parents and children or step children under the age of 21, of U.S. citizens. Family members who are not as closely related to U.S. citizens and close family members of permanent residents can also qualify for a family sponsored green card. These family members will be added to a wait list and will have to wait for a green card to be available. This process can take from five to fifteen years. For U.S. citizens, this includes brothers and sisters as well as children over the age of 21. Husbands, wives and children of permanent residents also fall under this category. The diversity green card is part of a United States government program, commonly known as the Green Card Lottery, which is designed to help increase immigration from those countries that do not generally have large numbers of immigrants coming to the U.S. The Green Card Lottery is done yearly and timed to enter changes every year. The lottery entry dates are normally between October and December. The U.S. government selects 100,000 lottery winners. Of these, there are usually about 50,000 to 55,000 green cards given because the government assumes that many of the lottery winners will not qualify for residency. Because qualification for the Green Card Lottery is limited to those countries that do not have large numbers of U.S. immigrants, people born in countries such as Mexico, China, India, the Philippines, England and Canada are not eligible to participate. More information about the [GREEN CARD LOTTERY]. You can apply for a permanent residency green card if you are looking for political asylum or refugee status. You can apply for political asylum if you have an expired visa or even if you are in the United States illegally. As a rule, you should apply for political asylum within one year of arriving in the country. However, there are exceptions that allow for filing for asylum if you have been in the U.S. for more than a year. In order to qualify for a green card in this way, you must prove that you have either been persecuted in the past or have a legitimate fear of persecution in your home country. Persecution based on nationality, religion, race, political opinion or membership in any specific type of social group are good examples. Many people come to the United States on a temporary visa as a first step in applying for a permanent residency green card. This allows you to be in the country already while awaiting application approval. B-1 or B-2: These are Visitor Visas that permit a visitor to remain for up to six months in the United States. The Visitor is not allowed to be employed. F-1: Student Visas permit foreign students to attend educational institutions in the U.S. and in some cases allow limited employment. K-1: This is a Visa for a U.S. citizen's Fiancï¿½. K-3: This Visa is for a Spouse of a U.S. citizen. P-1: These Visas are for Internationally Recognized Entertainment Groups and Athletes. R-1: This is a Visa for Religious Workers being transferred by a related international church to the United States. J-1: These are Visas for Participants in Exchange Programs. This type of Visa permits business trainees to learn about an occupation or profession in the United States and can be for a duration of up to 18 months. TN: These are one year Visas for Canadian and Mexican professional workers and can be renewed yearly. H-1B: This is a Visa for Workers in Specialty Occupations and permits a sponsoring employer to employ professional level workers for up to three years. 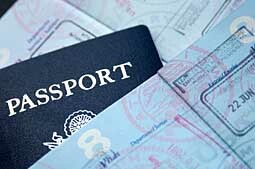 This visa can be renewed for another three years and in some cases additional renewals are possible. O-1: A Visa for Aliens considered to have Extraordinary Ability seeking temporary employment. This can be renewed yearly and can be issued for as long as three years. E-2: Treaty Investor Visas allow for investors to invest a substantial sum of money and to also acquire a controlling interest in a business active in the United States. These visas are issued to investors from certain countries for up to five years and allow the investor to work in his or her own business. This is a renewable visa. It is also possible for the investor's spouse to qualify for an unrestricted temporary work card and children that are under 18 are permitted to attend school but are not allowed employment. Felipe Calderon, the president of Mexico, was scheduled to arrive for a Sunday visit to the United States amid the debate amongst presidential candidates regarding the illegal immigrant situation within the U.S. If you are looking for legal help with immigration, citizenship, a green card or a temporary visa, please click the link below to submit your request to an immigration lawyer. I am unable to apply for unemployment benefits or register to seek for employment with state agencies. Also, since it's been a year that my application has been pending indefinately, I don't know if my daughter could receive citizenship on time because she turns 18 in April. This will make it very difficult for her. She'll have to apply for student visas, which will make her ineligable to receive state tuition for college.